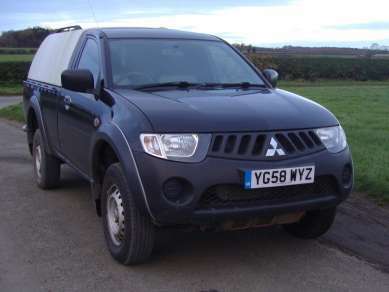 2008 58 MITSUBISHI L200 2.5 DID 4 LIFE 4X4 SINGLE CAB PICKUP BLACK 63,450 MILES, 3 OWNERS, REMOTE CENTRAL LOCKING, AIR CON, E/W ,RADIO/CD, CLOTH INTERIOR, ROPE HOOKS, LOAD LINER, CANOPY, TOWBAR. SERVICE HISTORY. MOT APRIL 2019.